Panic is an interesting book. On the surface, it’s a bunch of just graduated teens, looking for a way to spend the summer in a town with not much to do. Panic is invented as a way to test the bravery of teens and give entertainment to the participants and the spectators. But it’s more than that. It’s about revenge and anger, about looking for a future; it’s about finding a place to belong. Heather and Dodge are competitors, each fighting for a different reason. They both come from less than ideal homes. Heather has a drunk, barely there mother who doesn’t care about taking care of her children. Dodge lives behind a diner in an area of town known as Meth Row. Heather had no intention of joining Panic, but she wants to feel important, valued. Panic gives her a way to do that. Dodge wants revenge after holding onto his anger for years. This is his chance to do it. Heather is not the strongest character in the beginning. She’s doing this as a way to try and heal the heartbreak of teen love. She’s got courage, but she doesn’t know how to fight. She goes along with things, wanting to change them, but not actually doing it. Through the game, she discovers that she can do something about her life. She can fight and make changes. The life she has now doesn’t have to be the life she has to have. Dodge, on the other hand, is fighting for something he believes in. Unfortunately, he’s so blinded by anger that he can’t see that the people around him don’t need revenge. He sees the game and the only way to even the score. He has a lot of demons he has to fight, but instead of realizing they are personal, he thinks the only way to defeat them in to get revenge. Even the secondary characters are fantastic. Nat and Bishop, originally Heather’s best friends, become Dodge’s friends as well. They have a perfectly realistic friendship, complete with jealousies, insecurities, and not being able to completely understand a person, even when you’ve known them your entire life. It’s wonderfully well written and real. The action plot of the book is unique. It starts a little slow, but the game isn’t the main focus of the novel. It’s there to drive the character development, but it’s pretty interesting as well. It’s a game that’s entertaining and frightening to those watching, and a way to test endurance and courage of those participating. 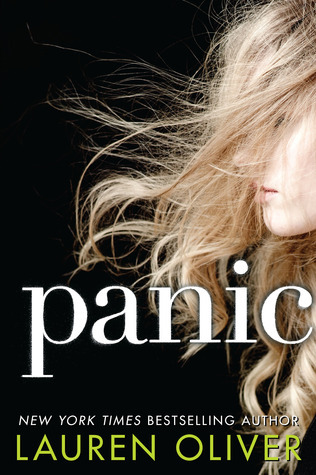 Panic is probably not the book you thought it was. It’s about a game, yes, but there’s so much more. It’s about fighting personal demons and finding a way to fight for yourself. It’s a wonderful book that’s worth a read. This entry was posted in Contemporary, Mystery, Thriller, and Suspence, Young (and New) Adult and tagged Contemporary, Lauren Oliver, Mystery/Thriller, Suspense, Young Adult.